Posted by youngm2015 in Genealogy / Local History, Reference. Posted by youngm2015 in Beneficial Bits n' Bytes, Reference. Hi everybody, Maggie here with the latest installment of free websites to improve your life. Recently with so many affected by Hurricane Matthew, I was looking for worldwide and up to the minute weather views. I stumbled upon Ventusky.com, the site below, and I’ve included some other sites to expand our minds and understanding of where we live on a global scale. I hope you enjoy and learn something new. Here we go! Or get the free google earth download <https://www.google.com/earth/> to visit and explore the earth, stars, moon, AND Mars! Can you think of any other sites that help you understand the earth and beyond? Share in the comments. Posted by CCLD in Beneficial Bits n' Bytes, Reference. 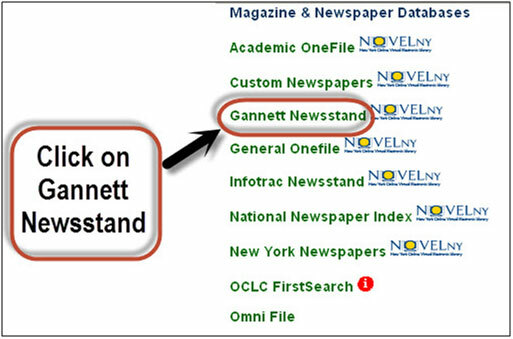 Did you know the NOVELny program now offers library patrons throughout New York State Access to all the Gannett Newspapers which include full-text archive of the Elmira Star Gazette 1999- present, Binghamton Press & Sun-Bulletin 1999-present, Ithaca Journal 2003-present, Rochester Democrat & Chronicle 2003-present? Here are directions on how to access newspaper articles. 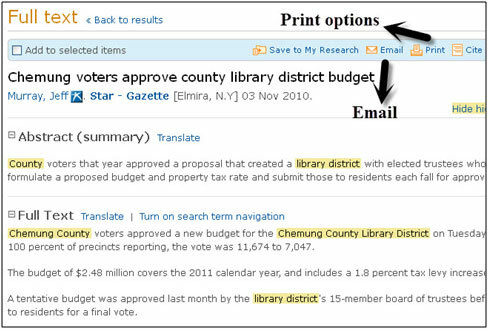 In this example we will demonstrate how to limit a search to a specific newspaper. Click on the steps below for illustrations. 7. Once you open the article you have several options to save the article including email or print. Posted by roganp in Recommendations, Reference, Technology. One of the lovely parts of the traditional librarian’s job was what we call “Readers Advisory”. We would read (not at work but at home) a variety of fiction and nonfiction books so we could suggest books to our patrons. We used to make up lists of books in different genres such as thrillers, cozy mysteries, recent biographies, etc. and have the lists available in the fiction section and at the reference desk. We no longer have the staff to do that and we read reviews at night, instead of books. Technology has taken over every part of our lives and we now have a database called Novelist that we use at the reference desk to find a book for a patron who says they have read everything by a certain author and want a suggestion for a similar book or author to read next. You can find your next good read by using Novelist too! It is available, with your library card, from home or wherever you access the Internet. Start by visiting our website: http://ccld.lib.ny.us. Near the top of the page, you will see a ribbon that starts with “about us”, “find materials”, and then “online research”. If you hold your mouse over “online research”, another menu will open. Click on the first option, “databases”. From the databases page, under the “literature” heading, you will find Novelist. Click on the link for Novelist, enter your library card number on the page that appears, and you will be in the database. To find books or authors similar to others you like, start by typing the name of a book or author into the search box at the top of the page. From the search results, click on the desired author or title. On the right hand side of the screen you should see a list of “read-alikes from Novelist”. For authors, if you read the description Novelist provides of the writer, it even suggests what book to try first. Under the list of “read-alikes” on the right side, Novelist describes genre, pace, tone, storyline, etc. of the selected author or book and will allow you to search for additional read-alike authors or titles, by selecting the box next to what you like about that author or book and clicking the nearby “search” button. 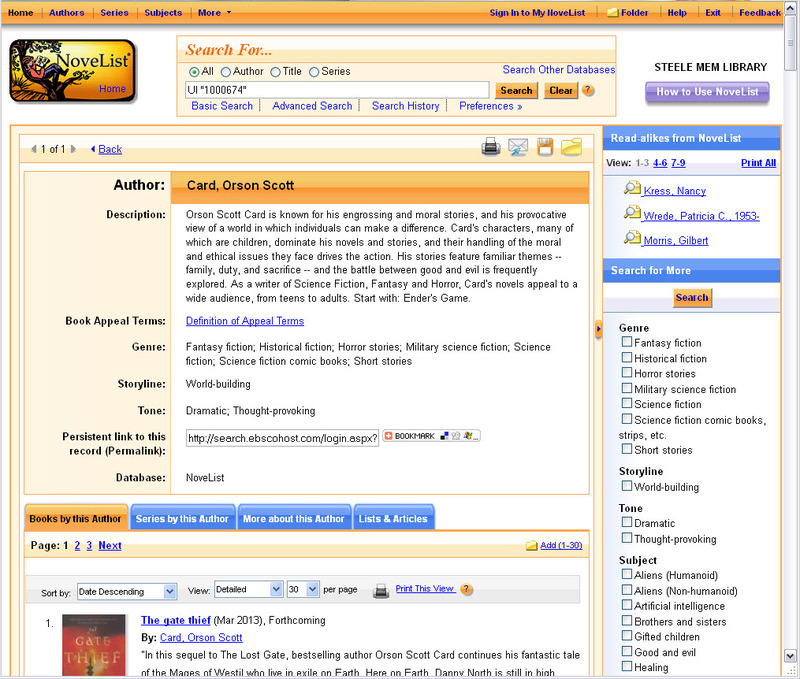 I use Novelist to find more books for my husband as well as patrons at the reference desk. He thinks it’s because I’m a librarian that I can always find him something good to read. But anyone can now do it by going to Novelist. Try it and let me know what you think.